For the March journal quilt, I chose to create my own fabric for the base using the lyrics from two songs: “Fix You” by Coldplay and “May You Stay Forever Young” by Bob Dylan. I think what resonated so much with these songs – particularly the first one (Fix You) is that underneath trying to be happy and “putting on a good face” for everyone, I have been struggling with depression and some rather significant life-changing events that affect my core being and soul. The second song, particularly as I read the lyrics more closely, are the wishes and hopes that I have for my daughters. These are the things that I hope their lives have and the spirit in which they live their lives – now and when they are adults. So, after watching the movie and being moved by both of these songs (and almost 3 weeks later still thinking about the movie and its message), I felt like these song lyrics really needed to be reflected somehow in my journal quilt. I printed the lyrics on cotton fabric through an ink-jet printer. The color I chose is green – it’s one of my favorite colors. 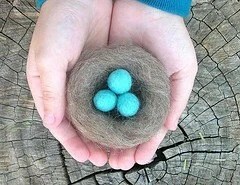 It also symbolizes growth and new life. Certainly dealing with all the issues associated with caregiving are making me grow and learn more – both about myself and for those I am helping in different capacities. This month also marked the melting of all the snow and ice (thus, I left the fabric white rather than painting it), and tiny blades of green grass are peeking through the ground (the color of the ink/words). – The sun – finally the sun is shining more and feels much warmer than it has for many months. The fabric sun is pieced onto the quilt – there are 3 different colors of fabric used, and 5 different colors of embroidery floss. 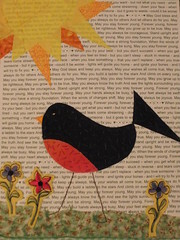 – A robin – although there have been robins that wintered over in different parts of the Twin Cities, I did not see any here at the farm all winter. The first one I spotted here arrived in the middle of March. – Three Flowers – the tiger lilies are starting to emerge from the soil and the yarrow by the apple tree is up. I included 3 flowers to represent my daughters and me, and to remind me of some of the fun things we’ve done this month (like see Diavolo at the Ordway, going to the Russian Museum with my parents, and the goat farm and feeding the baby goats). – Grass – blades of bright green grass are starting to push through the dirt and replace the dull, brown grass leftover from the fall. 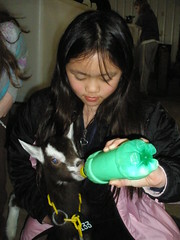 The local homeschool co-op arranged a field trip to a local dairy goat farm. The girls were able to feed several baby goats, see where the hundreds of goats lived, and watch the afternoon milking process. The farm is the largest one in the midwest, and sells its products in the local stores, co-ops, and at the farm. After feeding the baby goats, the inevitable question was asked, “Mom, can we get some goats?” Maybe in the future, but at this time the animals we have (domestic and livestocks) are more than enough to keep us busy. One of the things that I’ve enjoyed about this year’s science curriculum is the number of hands-on experiments that bring to life what might be a difficult concept to grasp. This week, the girls are learning about electricity and circuits. 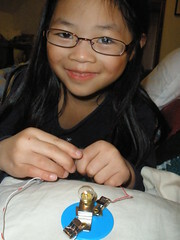 The hands-on activity was to set up a simple circuit with a light bulb and battery. The light bulb had a faint light. We taped more batteries together and the girls saw how the light would get brighter. With more voltage, the light became significantly brighter. Another experiment we did today was to make a simple switch to turn the light bulb on and off. Both the girls enjoyed these activities and were excited to learn more about electricity. On the eve of St. Patrick’s Day, the girls set up a leprechaun trap and place their shoes on the table with the hope that they will be repaired by their cobbler-friend, the leprechaun. Last year, our shoes were in dire need of repair. Although they were disappointed that the shoes were left in the same condition that they were the previous night, they were happy that the leprechaun left some magical gold coins. This year, the trap came out again. The penny-lined pathway with pinecones here and there, some gems and rocks, and paper-cut shamrocks led to the trap. Along the way, the girls set up a little eating area for the leprechaun – with a blueberry on the plate and some water in the cup. In the morning, the girls awoke to a trap void of a leprechaun, but at the bottom were some magical gold coins again. 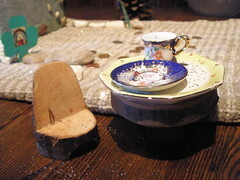 There was gold dust sprinkled all over the table, the floor, and even on the chair and plate where the leprechaun ate. As with last year, the shoes were not repaired. But that didn’t matter. The blueberry was eaten and the water was gone. And the girls had some gold coins. Ones they are keeping “forever”…because they are special to them and remind them of St. Patrick’s Day. Made a simple cheese – paneer – with Sophia and Olivia. Started with a gallon of whole milk and heated it on medium heat. Added lemon juice and then the curds began to separate from the whey. Eventually, when the whey turns a yellowish color, it is time to pour the mixture through a clean dish-towel lined colander. The curds will remain in the colander while the whey drains through the holes. Then the towel needs to be twisted at the top and even more whey will be released from the curds. 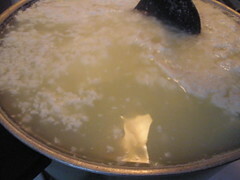 The curds then are placed under a water-filled container for about a day. They cheese is then ready for use. In retrospect, I would have added some fresh herbs or other flavoring to the curds before placing it under the water-filled container. In this way, there would have been some taste to the cheese. Otherwise, it is a rather bland cheese. Nonetheless, it was an interesting process to watch…and an easy introduction to cheesemaking. I taught an agriculatural class at the local homeschool co-op where the girls meet twice a month. 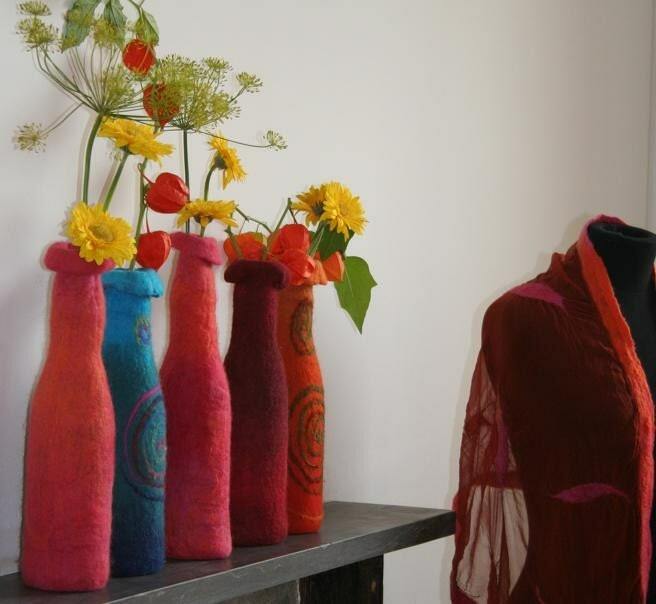 During this class, the focus was on fiber – from both plants and animals. Here, Olivia and another student are using the carders to card some wool from sheep I use to raise. Hand-carding is a traditional method of preparing fleece and fibers for spinning soft, lofty yarns of varying fiber lengths. The purpose for carding is to separate and straighten the wool fibers. 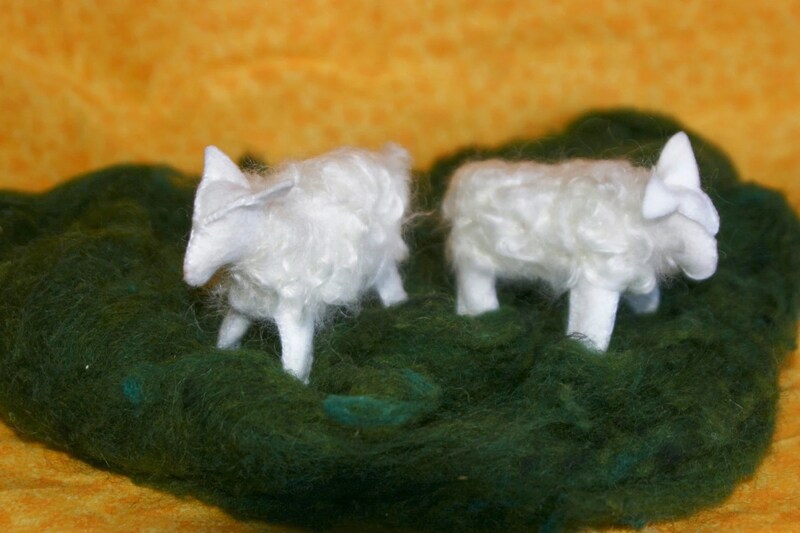 The result is a batt of lofty wool that makes spinning easier. 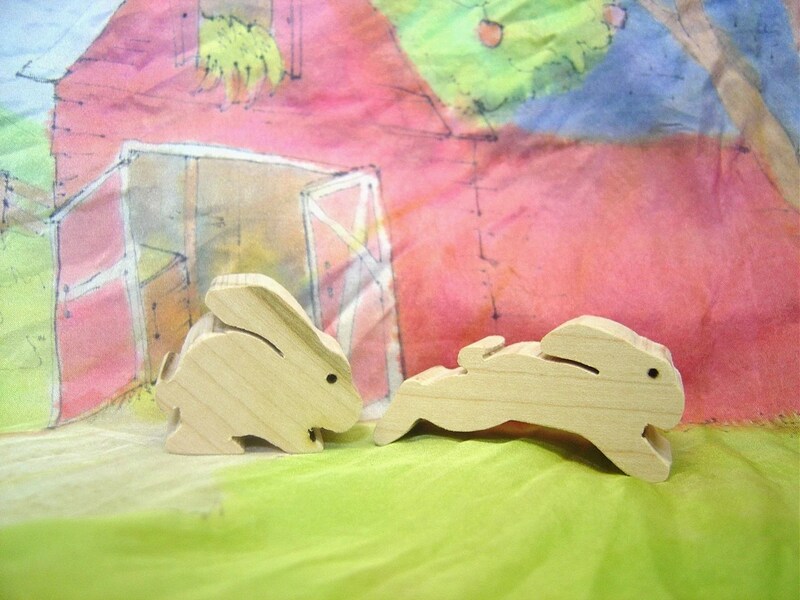 Hand-carders are a pair of wooden paddles with wire faces. The wire teeth are either course or fine. The course teeth are for carding wool, mohair and course fibers. The fine teeth are for carding cotton and softer fibers like angora. 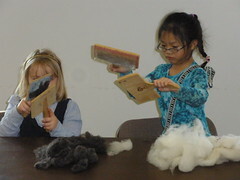 The girls enjoyed carding the wool and pretending they were pioneers. It was interesting to watch how such simple items – carders and wool – could lead to such interesting play and discussion.